Sanitized AG, a Swiss supplier of antimicrobial products for the plastics and textile industries, has opened the new SANITIZED TecCenter at its Burgdorf headquarters. 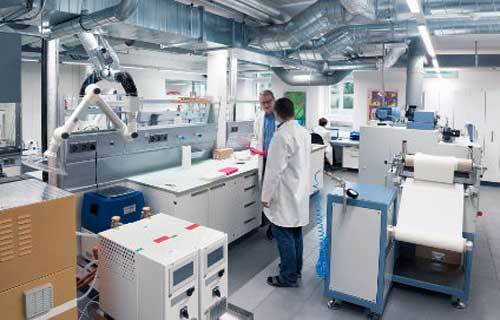 The new TecCenter offers testing capabilities for polymer and textile coatings. It has the equipment to manufacture plastic films or coating support systems and textiles. Repellent plastics and textiles can be subjected to extensive endurance tests, including thermo gravimetric analysis, thermo tests for polyvinyl chloride (PVC), heat and cold (jungle test), tension, exposure (QUV/spray, QUV/Se, Sun test XLS+), wash resistance and watering. “The equipment in our new SANITIZED TecCenter, allows us to conduct application tests at laboratory level to advance product developments and optimization which, so far, had to be carried out in customers’ manufacturing processes at great expense in terms of machinery, time and energy,” explained Urs Stalder, CEO of Sanitized AG. The SANITIZED TecCenter is also equipped to carry out all relevant microbiological laboratory tests. Depending on the envisaged type of protection and applied Sanitized technology, the center can test for mold formation, odor development, material deterioration, dust mites or bacteria growth – either individually or in combination.